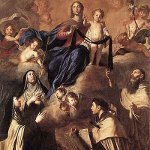 Feast of Out Lady of Mount Carmel is annually celebrated in Chile on July 16. This public holiday was established in 2007 and it replaced an official holiday of Corpus Christi. Our Lady of Mount Carmel is one of the titles, given to the Blessed Virgin Mary, since she is a patroness of the Carmelite Order. The first Carmelites were Christian hermits, who lived on Mount Carmel in the Holy Land in the end of the 12th century – beginning of the 13th century. They built a chapel, dedicated to the Virgin Mary (present-day Carmelite Monastery in Haifa). In the end of the 17th century the Carmelite Order had experienced tough times, but in the late 19th century the order was gradually revived. Currently, there are the Carmelite Monasteries in most countries of Europe and America, including Chile. Out Lady of Mount Carmel is the patroness of Chile, that is why her veneration day is a public holiday in this country. The full name of the holiday is Solemnidad de la Virgen del Carmen, Reina y Patrona de Chile, but it's actually never used.